SMART LOOKING, GOOD SPEC, QUALITY BRAND, SMALL AND NEAT! 500GB SATA Hard drive for storing files, photos, music, etc. This is a great system for home,business or student use. Small dimensions to make it easy to fit in tight spaces! Item is sold pre-loaded with genuine Windows 10 Professional from original Windows 7 with Windows 7 COA attached. 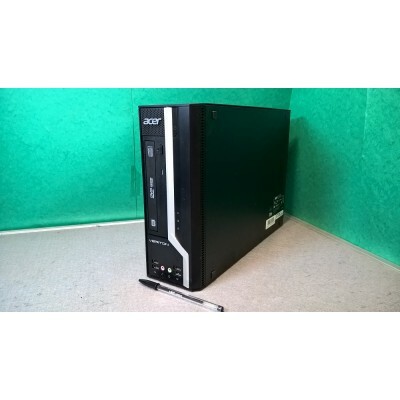 These systems are professionally refurbished to the highest standards. Each system is fully tested, every hard disk is fully erased and a clean install of Windows applied. All systems are cleaned inside and out. As these systems are used, there maybe minor cosmetic marks, such as small scuffs on the casing, but nothing that effects the working of the system. As all our systems are refurbished, they may have minor scuffs/scratches to the cases. These are purely cosmetic and in no way affect the performance of the PCs. If we feel that they are extremely noticeable we will attempt to show this in extra photos.Please be aware that the cosmetic condition of the monitor is not covered by the warranty. This particular system is in good condition. It does have some slight scuffs on the casing but nothing that affects its performance. Please see the photographs for more details as the one you see here is the one you will receive. Item is available for viewing / collection /purchase from our showroom in Bolton.